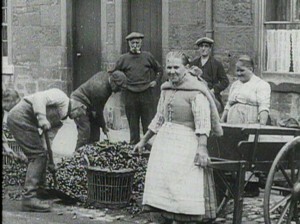 Still from St Andrews 1916, courtesy of Scottish Screen Archive. The earliest film of St Andrews for which we have a record dates from 1916. The film, which still exists, is currently housed at the Scottish Screen Archive as part of a 14-minute compilation of non-fiction film extracts of St Andrews dating from 1916 to September 1922, which can also be seen at the Museum of the University of St Andrews. The 1916 footage, which lasts just over three-and-a-half minutes, was made for – and presumably shown at – the Cinema House St Andrews. Indeed it was shown again as part of the cinema’s 50th anniversary celebrations in 1963, as a short before the main attraction, Alfred Hitchcock’s The Birds. The identity of the cameraman for this early footage is not known. The film begins with a pan across the rooftops of the town, shot from St Rules tower. This is followed by views of the town from the East (including a very primitive looking Crail Road), shots of Blackfriars Chapel and of South Street, on which we can see an interesting mix of horse-drawn carriages and motorised transport. There are then scenes of Kinnburn Park and Kinnburn House, now site of the St Andrews Museum; decorative field guns are visible to the edge of the house. We then see a fire engine leaving the fire station and driving into South Street (interestingly a motorcyclist cuts in front of the engine as it passes through the West Port). This is followed by further scenes of South Street, Blackfriars Chapel and St Mary’s Quad. The final part of the film concerns fishing, which was once so central to the economy of St Andrews. We see fishermen looking out over the East Harbour, shots of the fishermen’s cottages at the East end of North Street and fishermen shovelling cockles and mussels into wicker baskets and baiting lines. Particularly striking are the images of fisherwomen, wrapped in shawls, talking and laughing and looking into the camera. Although the film is short, the fact that it has survived should be celebrated, for it gives us a brief insight into St Andrews at the time of the First World War. We get a wonderful sense of its streets and architecture, before they were overrun by traffic and chain shops, and of its inhabitants and their lives.